Chris Wilder admits the Cobblers are in a great position after a week of watching their rivals drop crucial points. But the manager says the team’s rivals’ slips will only be properly punished if the Cobblers now go on and ram home their advantage. With Town out of action due to scheduled opponents Oxford United’s involvement in the FA Cup last weekend, the Cobblers sat back and relaxed as second-placed Plymouth Argyle lost to Wycombe Wanderers, and fourth-placed Bristol Rovers went down at Accrington Stanley. 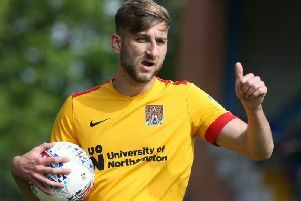 They were results that saw the Cobblers remain two points clear of Argyle and 11 points clear of Rovers, and they have two games in hand on each of those teams. As an added bonus in midweek, fifth-placed Portsmouth then conceded a last-gasp equaliser at Morecambe - scored by goalkeeper Barry Roche - to ensure Pompey are now 13 points adrift of the Cobblers having played the same amount of games. The games in hand on Argyle and Rovers come later this month against Oxford (Feb 16) and York City (Feb 23), and Wilder admitted: “Saturday was a decent day for us, because the teams in and around us didn’t gain any ground on us. “But it only matters if we take advantage of our games in hand, and we keep our heads down and keep on winning games. “We are in a great postition, we all know it and can’t get away from that fact, but it is only a good position if you nail down those games in hand. After their two-week break, the Cobblers return to action on Saturday when they host rock-bottom York at Sixfields (ko 3pm). Wilder faces a selection headache for that game, as since Town’s 3-1 win over Morecambe in their most recent game, he has brought in new signings Luke Prosser and Danny Rose, and he also welcomes Lawson D’Ath back from a groin injury.